Garlic (allium sativum) is increasingly popular among allotment holders and if you haven't already ordered, now is the time. Two types of garlic can be grown—hardneck and softneck, as well as wild garlic, the type found growing along riverbanks and in woodland. Hardneck is best for this part of the country—it produces less (4 to 6), but bigger cloves than softneck varieties. 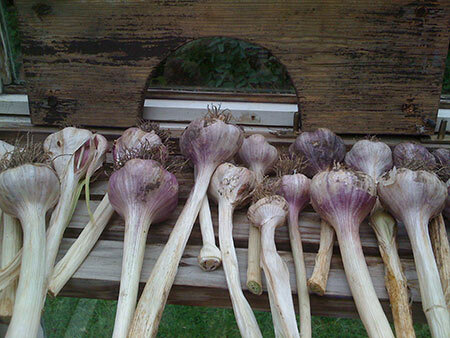 Garlic prefers a mild, warm climate and doesn't like too much rain. In Scotland therefore, it's best to grow varieties tried and tested in colder climates. Plant in autumn, several weeks before the first frost, or any time from January to March—the only difference with autumn planting is that you will have potentially larger bulbs. Some like to plant on the shortest day of the year in December, ready for catching the light as it progresses into a new year. Garlic likes a sunny spot in free draining soil, not compacted or boggy, and can be grown relatively closely together, about 10cm apart and 15cm between rows. Plant just under the soil. It is resistant to most diseases apart from white rot, which, once in the soil, can take years to die away. If you have white rot (which seems to be present across Warriston) it may not be possible to plant alliums in the infected area for around 8 years, sometimes longer.